“We want teachers to be able to walk into their classroom and know that kids can only access whitelisted content,” says Bharath Madhusudan, CTO and co-founder of Securly. 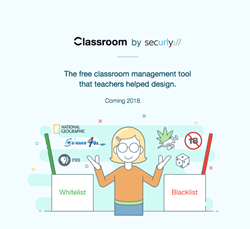 Securly - the world’s leading student safety company is planning to release a free classroom management tool focused on Chromebooks in Q1 2018. Due in part to the increase in 1:1 environments, classroom management tools have become a necessity for many educators. These tools allow for teacher to know that kids are on task during class by providing them the ability to see activities within their classroom. As classroom management becomes popular, the tool became quickly commoditized, while maintaining the strain on IT budgets that are already stretched thin. Classroom by Securly is intended to alleviate this strain. Classroom by Securly works in conjunction with Google Classroom to import rostering data into Securly’s interface with a single click. This in turn allows educators the ability to be the IT admins of their own classrooms. Educators will have the ability to whitelist the handful of websites that are relevant to classroom instruction while blocking others. They will also have the ability to monitor the screens of student owned devices. 2018 will also see Securly marketing student safety solutions directly to parents. With Classroom, educators (who are the critical link between the school and the parent) will be able to further influence parents to use Securly solutions in the home, thereby securing students online safety at school and at home. Securly is a venture capital funded education technology company that designs student safety solutions designed for K-12 schools.